My life as a voracious reader began in childhood, but matured at some point in early adolescence as obsessive. That early obsession was grounded in collecting and reading Marvel comic books as well as science fiction novels—early Michael Crichton, Larry Niven and Jerry Pournelle, and Arthur C. Clarke. I have steadily plowed through my reading life discovering and then devouring new writers. 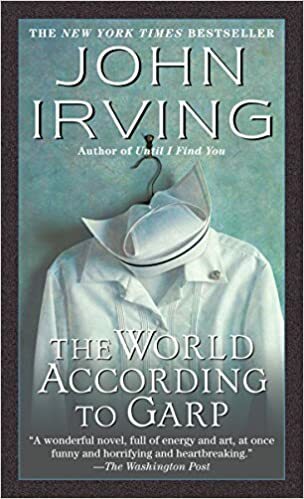 In my last couple years as an undergraduate English education major, I was in my John Irving phase, spurred by falling madly in love with his The World According to Garp. Naive and often clueless, I was a twenty-something who hoped to be a writer, and desired more than anything a deep and unique love. My idealizing falling in love and marrying was compounded with idealizing Garp’s life as a stay-home husband/father. While I have read most of Irving’s novels, and loved quite a few, it has been years since I read Garp and realize I may now find much of the novel, and Garp’s domestic self, far more problematic. However, while I have never become the novelist and fiction writer I had planned, my life as an academic and writer has included domestic elements that I genuinely enjoy. Since I teach most often on a Monday, Wednesday, Friday schedule, I have for many years remained home to write and work on Tuesdays and Thursdays. Also starting more than four years ago, I have been a caregiver for, first, my granddaughter, and now my grandson on Tuesdays. Whether I have been home to write and work or to watch my grandchildren, I spend part of my time washing dishes and washing, drying, and folding laundry. Some days I also make a trip to the grocery store. Laundry, while being a chore, also provides a bit of zen for me. I find a certain peace in folding and hanging up clothing the way I prefer. As a man, I recognize the absurdity of finding peace in the sort of domestic chores society has imposed onto women, that many marginalize as “women’s work.” It is a sort of absurdity that could easily ignore that women historically and currently often must navigate a professional life as well as their domestic obligations in a way that men can drift into and out of—or even avoid—without much consequence. One of my favorite, although heavy, units I taught while a high school English teacher included using the film Pleasantville as an entry point (focusing on the TV mother character) into exploring women poets—Adrienne Rich, Sylvia Plath, and Anne Sexton—in terms of how their status as women impeded on their work as poets. As I have shuffled back and forth between writing and doing the laundry, I have more than once paused against the awareness that Plath’s life overwhelmed her as wife, mother, poet. An awareness of the millions of women who have suffered and now suffer the same fate without the spotlight we shine on the celebrity-tragedy of Plath. There is a convergence here since my mother was the most important influence on the reader I became, the writer I would become because of that reader life steeped in science fiction and comic books, and since my mother imprinted on me an indelible image of the domestic life of women. My mother, Rose, was a child of the 1950s, and she spent much of her life caring for her siblings, and then her own children before later running a daycare. Even when she worked outside the home, my mother did the laundry, cooked, and provided the bulk of the childcare; she also handled the bills—and quite frankly it seems did everything. And as Caralena Peterson explores about women academics, my mother appeared to do everything extremely well and nearly effortlessly. Today, as my iPhone reminds me, is my father’s birthday and my parents’ anniversary. They died about six months apart less than two years ago. My parents were very 1950s, very Southern and white. They were also uncritical embodiments of gender stereotypes and obligations. Hard work matters, I believe because of them, for the sake of making the effort, and I do find some tranquility and sense of accomplishment in doing things the right way, or at least a purposeful way. Like carefully folding each piece of clothing because each piece of clothing—whether yours or someone else’s—deserves that moment of purpose. Part of the celebration around Irving’s Garp, which eventually led to a film starring Robin Williams, revolved around his provocative topics, but the novel also spurred a conversation about Garp as domestic husband. In no small part, the public discussion equated “domesticated” with “emasculated.” A man without a job was no man. This was a long time ago when I was far less aware, but I don’t really think that conversation interrogated that Garp as a man still had a decision. A decision that women are often not easily allowed. I often find the sink filled with dirty dishes, and the dishwasher storing clean dishes—from when I started the cycle. Whether late at night before bed or first thing in the morning, I often make that right. Putting away clean dishes. Filling the dishwasher and starting another cycle. This seems simple; some would be compelled to compliment my helping out. But this is not some other person’s chore. This is something I choose to do, in part because it brings me a calm to set things right. It is, however, a decision I can make. It is my remaining privilege as a man. Today as my grandson plays, and as I write, do some work, I cycle through washing and drying all the dirty clothes, folding them warm and clean smelling on the day my father was born, the day my parents were married 59 years ago.